One of my favorite things to do in New York City is to walk. I walk everywhere and only take the subway or a taxi if I absolutely must. One of the benefits of using your own two feet as transportation is how many thing you happen upon you wouldn’t have seen in a car or on a subway train. 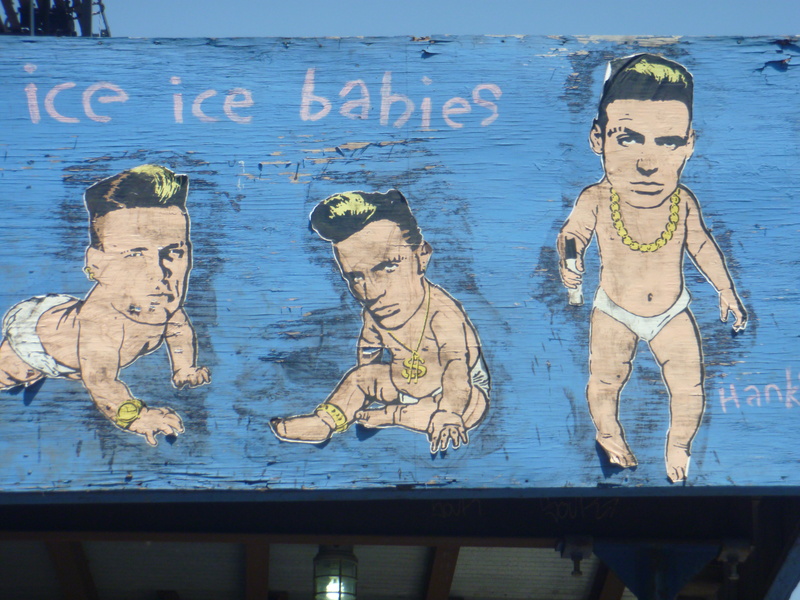 The doorways, scaffoldings, walls, fences and sidewalks are an ongoing constantly rotating exhibit of street art. Around every corner is a surprise. 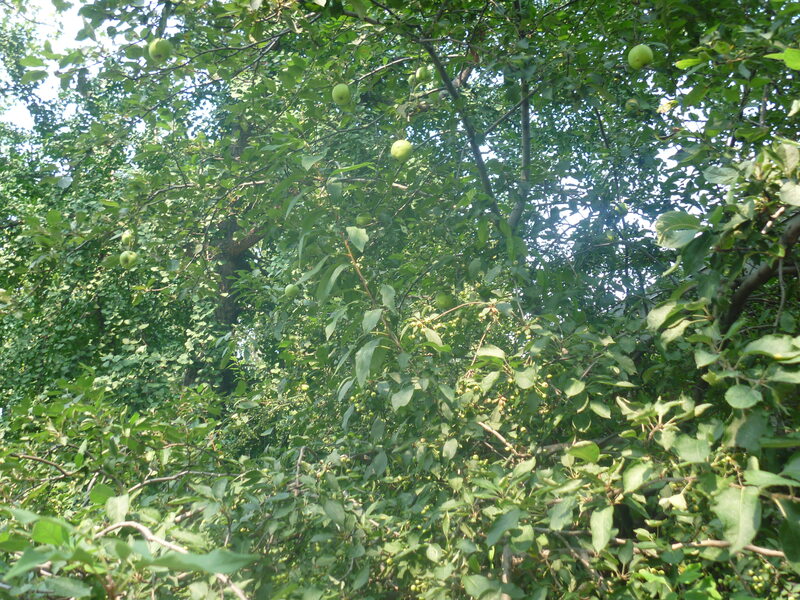 This tree filled with large green apples is growing unattended on a boulevard at Delancey and Chrystie streets, right next to it was a Ginkgo tree heavy with cluster of ripe ginkgo nuts. NYC is a foragers dream. It always surprises me how many fruit trees grow on this island and how many produce perfect fruit without an ounce of pesticide. In our community garden the Peach tree bares a huge amount of perfect, sweet, peaches each year and the only thing I have ever seen anyone do to that tree is, well, pick the ripe peaches. 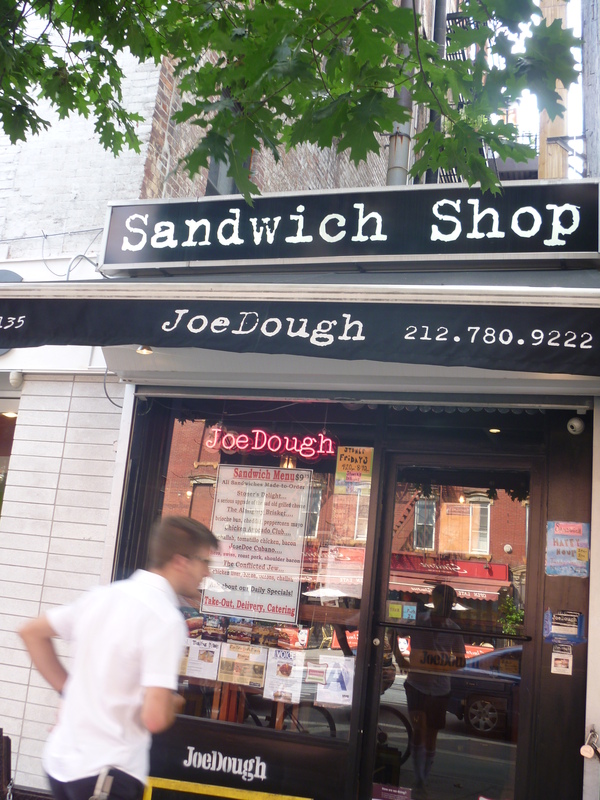 Joe Dough started out as a restaurant (Joe Doe) on First Street between First and Second Avenues and this past year opened up a sandwich shop on First Ave near St Marks. 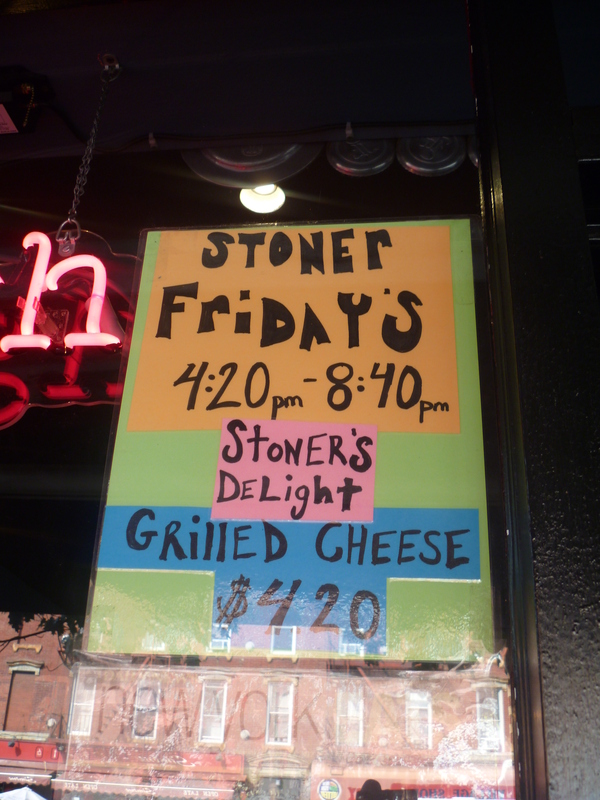 It hard to read the sign in this picture, but Joe obviously has a sense of humor and a great sense of what tastes great, most apparent in his sandwich called, The Conflicted Jew, the ingredients: Liver, Bacon, Onions on Challah. Yum. 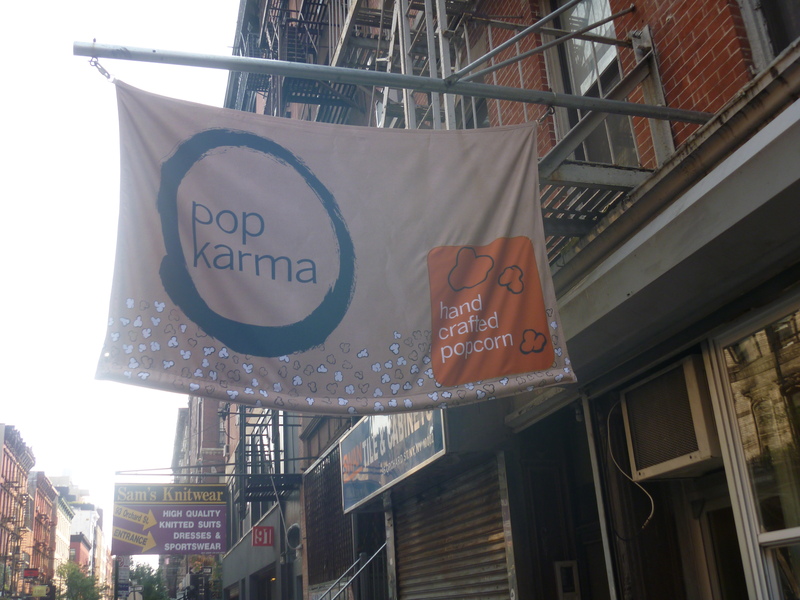 In the old Il Labratorio del Gelato Space on Orchard street has opened up a gourmet popcorn store called: Pop Karma. 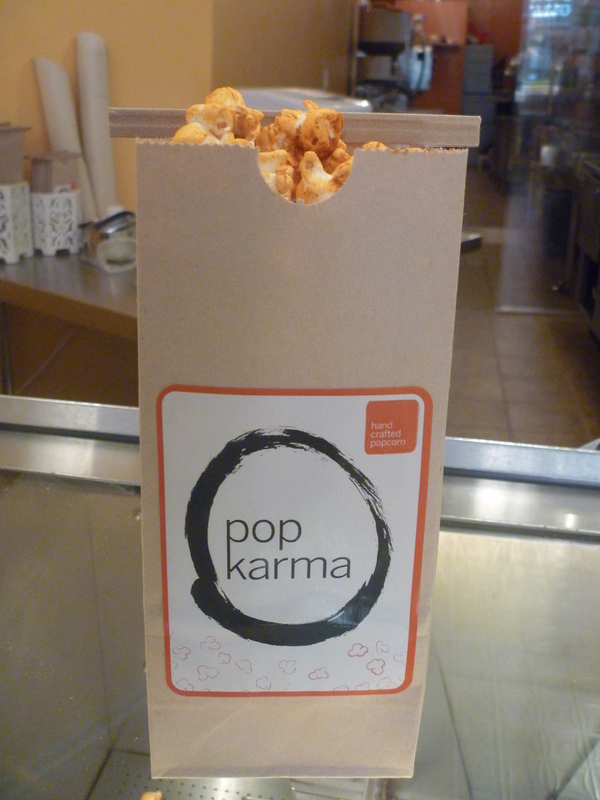 It was a great snack to walk with and I felt like I was eating something healthy. Tomorrow recipes for Cucumber Agua Fresca and Peach Basil Sangria and much more. We have a two night stretch without any house guests so I’m hoping to get caught up here! Fingers crossed. 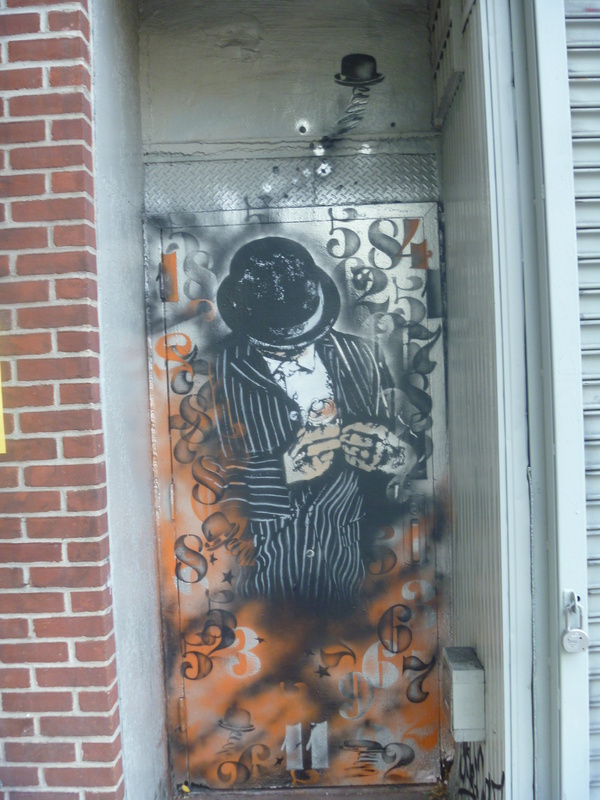 This entry was posted in NYC and tagged il labratorio del gelato, Joe Doe, Joe Dough, Pop Karma, Street Art. Bookmark the permalink. Gosh I so need to move there for reals. Sigh.